1. Repeat what has proven, wide interest — visit your "Content" report from your analytics dashboard. (From your account home, simply click "View Analytics" to get started.) The Content report lists publications in order of popularity, based on total view counts. ...give your readers what they tell you they want. Revisit the topics of some of your more popular posts. They have proven interest among actual readers. This is a great, foundational content strategy: give your readers what they tell you they want. 2. Repeat what lead to targeted engagement — visit your "Readers" report to see who, exactly, read your work. Look for clients, prospective clients, and readers from specific, target organizations and industries who engaged with previous work. This metric is valuable for its ability to show you specific engagement between content and targeted readers. Revisit the topics of posts that have lead to some of your most high-value targeted engagement. 3. Scan (and sign up for) JD Supra writing ideas — along with your own metrics to guide you, JD Supra editors also regularly publish writing ideas within specific practice areas. 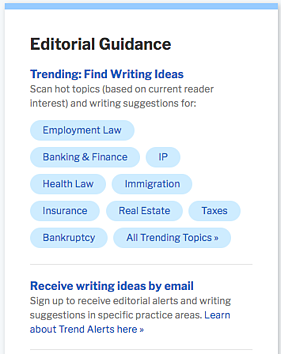 Scan these writing tips directly from your account homepage (look for the "Editorial Guidance" module). You can log in for these writing tips, or subscribe yourself to receive them directly by email.